Darius Pliskauskas scored four goals. The city side showed no mercy to the sorry Sheffield Steeldogs as they powered to a 12-0 success in their Group A opener at Planet Ice. Petr Stepanek scored four goals. It was a contest that had the feel of a pre-season challenge clash - not just in terms of attendance - rather than a battle in the chase for end-of-season honours. 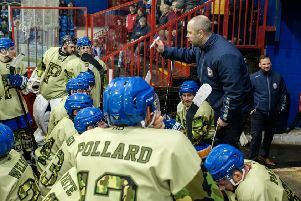 Sheffield failed to even provide the physical resistance for which they are renowned as they had no answer to the attacking prowess of their hosts, who found the twine with more than a third of their on-target attempts. It certainly wasn’t the ‘war’ which Phantoms import ace Darius Pliskauskas had publicly warned his team-mates to expect in the play-offs. The Lithuanian international will no doubt have enjoyed his evening though as he helped himself to a four-goal haul. That scoring feat was matched by fellow overseas ace, Petr Stepanek, whose rocket-like shots are fast becoming a memorable feature of this season. Phantoms had twice been denied by the pipes before Tom Norton succeeded in making the breakthrough with what is fast becoming one of his trademark blasts from close to the blue line. The defenceman reacted quickest to slam the puck through traffic after seeing his initial effort blocked. Stepanek jumped out of the penalty box to double the advantage when picking up the puck in centre-ice, bursting into the Steeldogs’ zone and firing past netminder James Hadfield from out wide. And the gap grew again when terrific passes from Norton and Ales Padelek put a powerplay goal on a plate for Marc Levers. Given Phantoms blew a four-goal cushion against the same opponents to lose a regular-season clash in overtime, there was no room for complacency. And there was no hint of it either as Koulikov’s men continued to put the visitors to the sword in the second session. Pliskauskas pounced after Stepanek had thumped a post, and soon doubled his tally with an unassisted strike. Another import, Wehebe Darge, then got in on the goalscoring act by bundling in before Stepanek converted a peach of a Padelek pass. A change of Sheffield netminder ahead of the final session – Brandon Stones replacing Hadfield – did nothing to stem the tide. In fact Phantoms finished with their most prolific period of all. Stepanek soon found a gap between the legs of the new custodian to complete his hat-trick before Pliskauskas did likewise when picking his spot following a Levers pass. Phantoms then took advantage of a couple of five-on-three situations thanks as Darge fired them into double-figures before Pliskauskas struck again. And the landslide success was completed when Stepanek lashed in another fierce shot late on. Reigning play-off champions Guildford triumphed 3-0 at league title-winners Telford in the other Group A game last night. Phantoms now travel to Telford this Saturday (March 25) before hosting Guildford on Sunday (March 26).